If you don’t have the time, nor the energy to do that, then the German Shepherd might not be a suitable breed for you…..
Did you think about things like accommodation for your dog? Can your German Shepherd have it’s own safe place, where nobody will disturb him? Can you lock that place? What are your plans when you go on holiday? Is the dog joining you, or did you arrange a good accomodation? Are you aware of the costs for an animal boarding house, or the costs for taking your dog with you on your holiday? Did you arrange for the proper vaccinations? As you can see, there is a lot to think about, before you make your decision…. 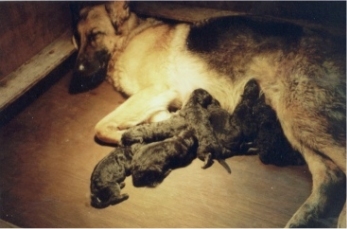 If this is going to be your first German Shepherd, it might be a good thing to have a look around in the world of the german Shepherd. Check if there is a training club near you, or visit a clumatch. Talk to other owners and/or breeders. Check your local book store for literature obout German Shepherds. What type of dog fits you? 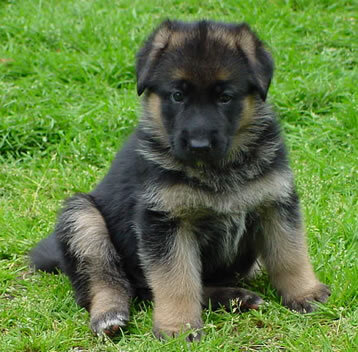 If you decide to go for a German Shepherd, then think about the type of dog you are looking for. A quiet dog, a spirited dog or a curious dog? A sire of a female? Females are generally a bit easier to control but they are in heat about twice a year, and attract a lot of attion from the sires in your area…..
What do you want to do with your dog? Training (protection, tracking) or maybe agility or flyball. Or just looking for a “house” dog? Do you prefer a certain color? When you finally know exactly what you want, you can start looking for a breeder, and have a look at some litters. Before you buy a puppy, discuss the matter at home with your family before you make the final decision. The decision has been made, and now you’re waiting for your new family member…. Good preparation is half the job. Make sure you have enough food at home, and discuss with the breeder what food you should take. Preferrably continue with the food the breeder started with. Provide good solid feed and water bowls that the dog cannot drag around. If you keep your puppy indoors, a bench is also a good suugestion. Make sure there is not too much things around that the puppy can damage. Find a veterinarian in your neighborhood, and make an appointment for the first check-up. Read about raising puppies. Maybe you like to visit a puppy training near you. Plenty of things to do before your new family member arrives.